The Oscars have come to an end (about three minutes ago), and with that all said and finished... so are a litany of Oscar Pools! Trivia Club is no different, as our third annual Oscar Pool has come to a close, with a second straight year of OSCAR CONFIDENCE POOL glory! The winner is the person with the most POINTS, with the number of correct picks breaking any ties. Both Saad K., our first Oscar Pool victor in 2012/2013, as well as Matthew S., our first Oscar Confidence Pool winner in 2013/2014, did not submit a ballot this year so a NEW Oscar Pool Champion will be crowned within Trivia Club! The winner will be awarded a real live trophy at the next convenient edition of the live Trivia Club event in Toronto! 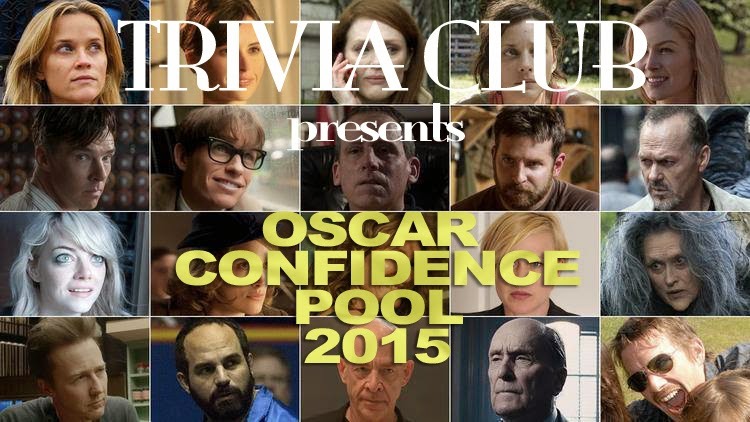 Below are the scores of all those that participated in this years Oscar Confidence Pool! Thank you to everyone who took part, it was an honor just to be in the running, I'm sure. The number next to each correctly picked category notes the amount of points wagered on it. The category chosen correctly, the most often? Julianne Moore's Best Actress win was chosen by all but two participants. The only category not chosen correctly by any of our participants? BEST FILM EDITING! No surprise, as Whiplash's win was a surprise pick for many. Our winner this year had not only the most points, but ALSO the most correct picks, with Film Editing taking away a full half of his possible points. To see a complete rundown of all those who won an Oscar in 2015 go here, and for more on the night itself, might we suggest this link. Russel Harder hosts Trivia Club in Toronto at Cardinal Rule (5 Roncesvalles Ave) every WEDNESDAY, at Hitch (1216 Queen St East) every other MONDAY, and at Lou Dawg's Ryerson (76 Gerrard St E) every TUESDAY!